Good day, my Friends! I hope you are doing well. I am happy to be able to finally reveal my “Around the Bend” quilt. 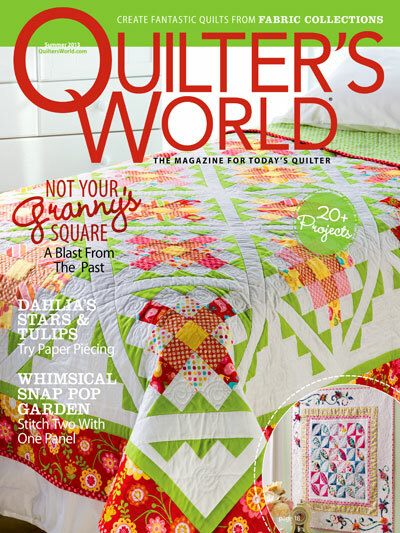 It is officially published in the June/July issue of The Quilter! 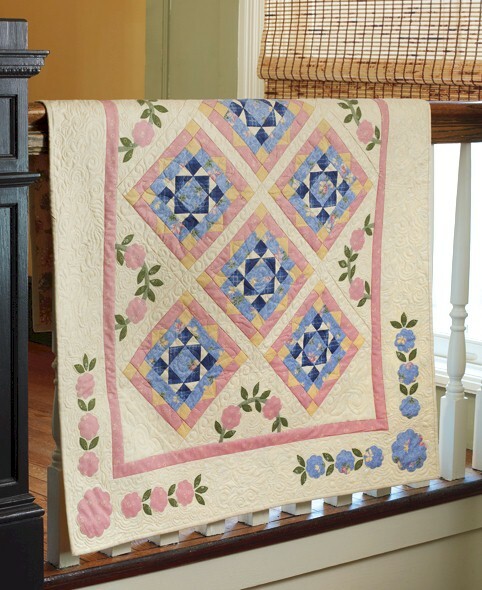 The soft and sweet feel of this quilt is achieved by using Thimbleberries’ Moonflower fabrics by RJR! Check these fabric swatches out! Any Thimbleberries fan out there? This quilt was set in an on-point setting. The twist I added to the design is the applique I added to the side setting triangles. 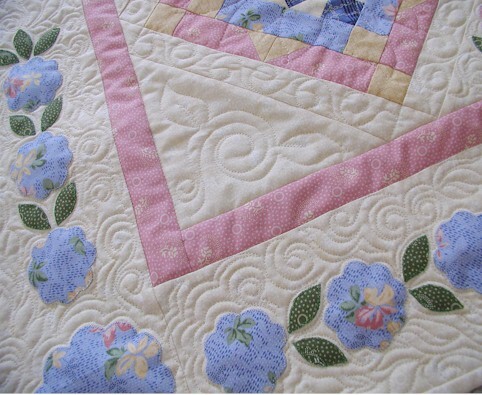 The simple floral applique shapes were then repeated in the cream border. 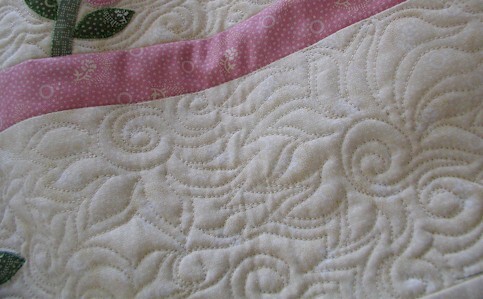 I purposely left the border rather plain in order to work in some fun quilting. 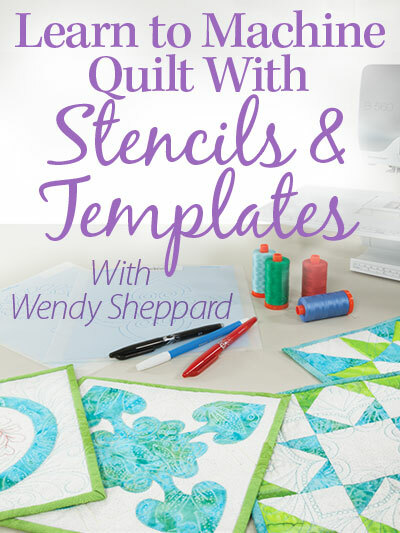 The quilting was totally unmarked, unplanned, totally spontaneous, and free-motioned. Threads used: Aurifil Mako 50 Cotton top and bottom, color 2310 to be exact. Batting used: Hobbs Tuscany Silk — if you have been visiting this blog for a while, you know I love that stuff! 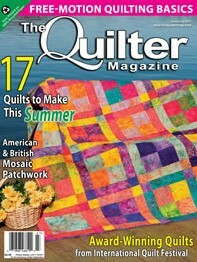 Quilt kits are available from www.heartbeatquilts.com should you want to replicate the project sample. Spring is finally here where we live – it will be picnic weather very soon for my little family. We are adding family picnics to Miss Baby’s repertoire of childhood experience. Thanks for stopping by. Have a fantastic day! This entry was posted in Quilt kit, Quilt Pattern, Quilting, Quilts & Projects: Published, Quilts: Pieced & Applique and tagged Around the Bend, Floral Applique, Pieced and Applique Quilt, Quilt kit, Quilt Pattern, RJR Moonflower, Thimbleberries Fabrics, Wendy Sheppard, Wendy Sheppard Designs. Bookmark the permalink. That is a very nice quilt. Another great job. Well Wendy there are no more adjectivesin my dictionary to describe this work of art. 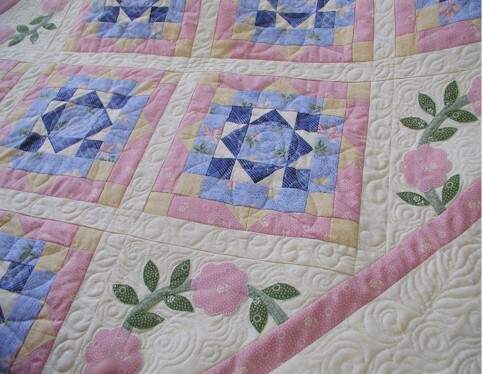 It is just beautiful,from the blocks to th flowers to the quilting. You are one amazing gal. I am on my way for tea with Miss Baby. That quilt is absolutely stunning…..just gorgeous. 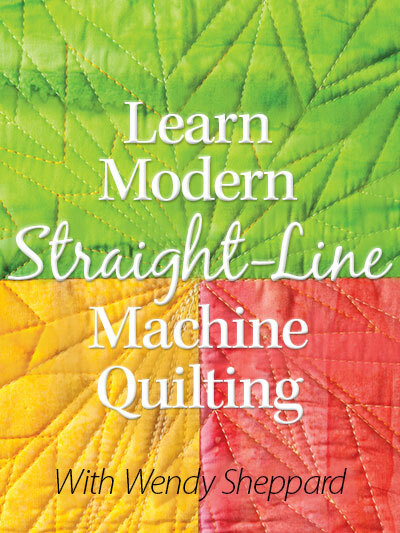 can I ask…is that needle turn applique? whatever it is…it is breath taking. Wendy, all your quilts are always so delightful to see. Bright and cheery. Oh this one is really sweet Wendy. That will be fun to start having picnics with Miss Baby! 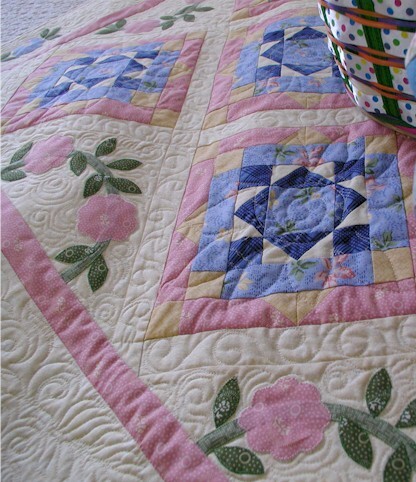 It’s a real beauty, and the “spontaneous” blooms in your quilting lines are great! I see another one I’d like to try. It’s a pretty fabric line for the florals. 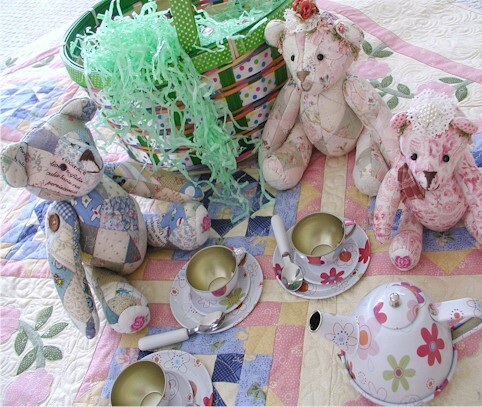 Enjoy the Teddy Bear Picnics, Baby will want to pick the pink flowers, you know it! Beautiful quilt. It is so spring-like. Your quilts are ALWAYS exquisite. Look at that Rhododendron…reminds me of the ones in Taranaki, here in New Zealand. congrats! It is a perfect quilt for spring. Drooling over your quilting. Perfection. I remember tea parties with my daughter. Making memories. So pretty. I love the blues and pinks and floral appliques. Your quilting is so appropriate for the quilt. Flowery, light, and scroll-y pretty. Just beautiful. Congratulations on another published work. It’s wonderful that you can earn something, even if it isn’t much, for the talent and efforts you make. It’s a hope that every one of us has – to get paid for something we love. I’m happy you’ve done it. Keep up the great work. What a lovely quilt and bear family! 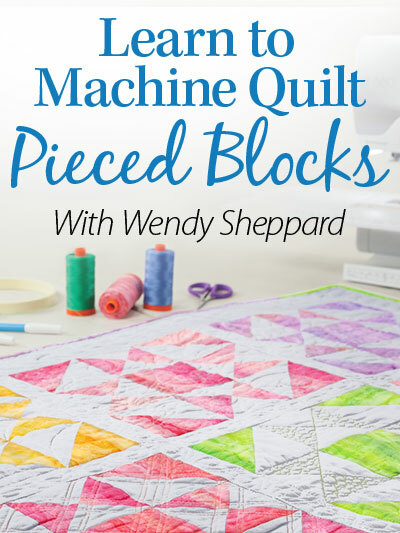 Your machine quilting is fabulous! I love your design! Just lovely ! I really like the applique in the setting triangles. 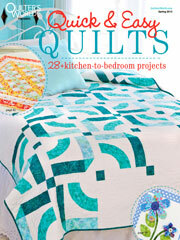 And how you left lots of spaces for all your beautiful quilting. WOW! I can hardly wait for my copy of the magazine! We always get it about a month late. 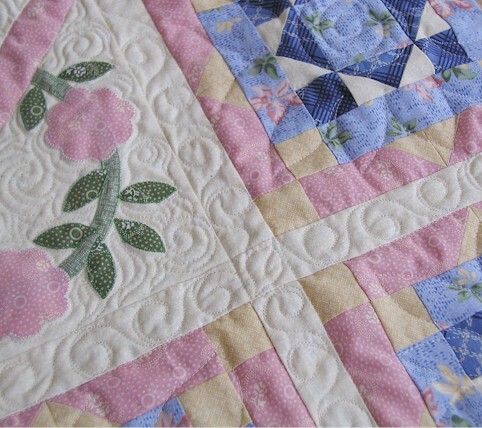 Beautiful applique, beautiful quilting. I love it! I just love, love, love your quilt. Even more more I love your quilting. I am very interested in buying the kit but the link you supplied keeps coming up as an error message. 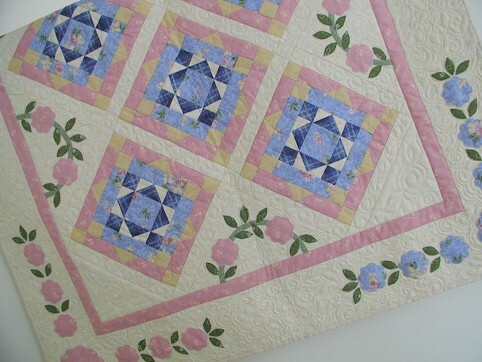 Such a pretty quilt and what beautiful quilting to compliment it! Another fabulous quilt by you, Wendy! Oh Wendy it’s so lovely – it has a very romantic and vintage feel! The quilting is just brilliant. 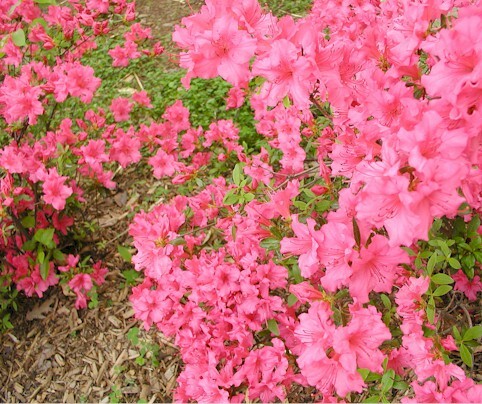 Enjoy your picnics – your azaleas are just stunning, my favorite flower next to tulips! Your quilt is simply beautiful…thanks for the swatches…I love thimbleberries. That is such a beautiful quilt. 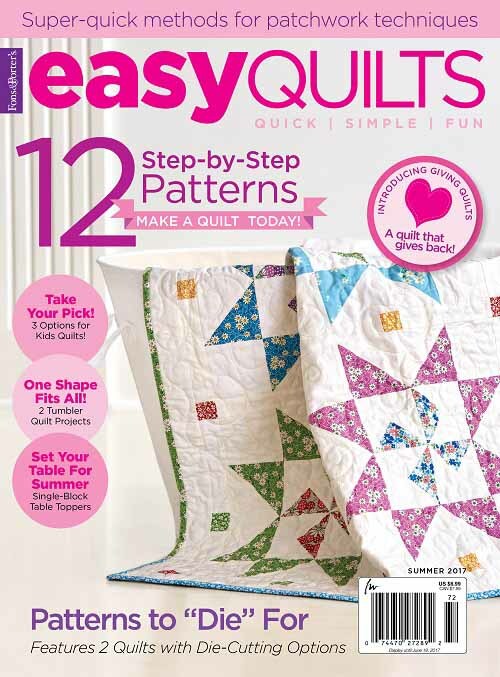 I hopped on over to Heartbeat Quilts to check out the kit (that is seriously how beautiful your quilt is — I hardly ever buy kits) and they don’t have it up yet. I’m going to keep checking back. I love your quilting and want to be as good as you when I grow up. Your quilting is really fabulous. 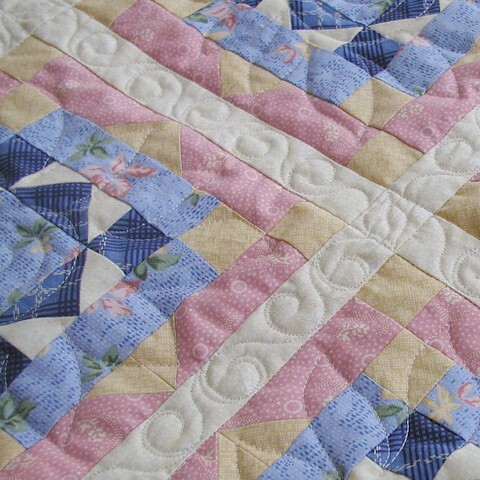 Such a pretty quilt — your quilting is extraordinary! I love the picnic scene shot. That’s the stuff of which magical childhood memories are made! Could I buy this patern from you.